At 12:45 p.m., on March 25, 1954, 2nd Lt. Boyd L. Erickson, 24, was killed when the F-94 Starfire jet he was piloting crashed in Cape Cod Bay near Orient during a routine training flight. The newspaper account mentioned that there was a radar observer aboard who was “missing”. He was not identified. Lieutenant Erickson was from Grand Forks, North Dakota, and he’s buried there in Memorial Park Cemetery. He was survived by his wife Dona Mae Erickson. 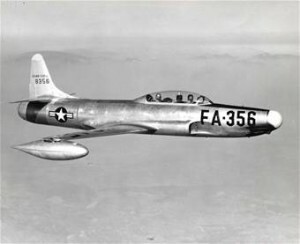 Lieutenant Erickson entered the U.S. Air Force in early 1951, and began his pilot training in August of 1952. He received his wings and officer’s commission August 1, 1953, and had been assigned to Otis Air Force Base at the time of the accident.